Bay Area Real Estate: Buy Now Or Wait? This is a sponsored post written by me on behalf of Chase. All opinions are 100% mine. I had dinner with a group of friends last week. Due to our age and the area we live in (mid-40s in the San Francisco Bay Area), buying a home was a hot topic among us. Many are looking to upgrade to a home closer to work and/or in a better school district. The rising prices and the potential for higher mortgage rates are also motivating factors. Many are afraid that they won’t be able to afford the home they want if they don’t buy now. It’s not just my friends. According to a recent survey by Chase, 70% of prospective buyers worry that they missed the chance to buy due to rising prices. To us in the San Francisco Bay Area, this rings true by our recent experience. Median prices rose 50% in the last three years. They doubled in some cities. What felt unaffordable two or three years ago looks like a bargain now. What would that home we want now sell for two or three years from now? 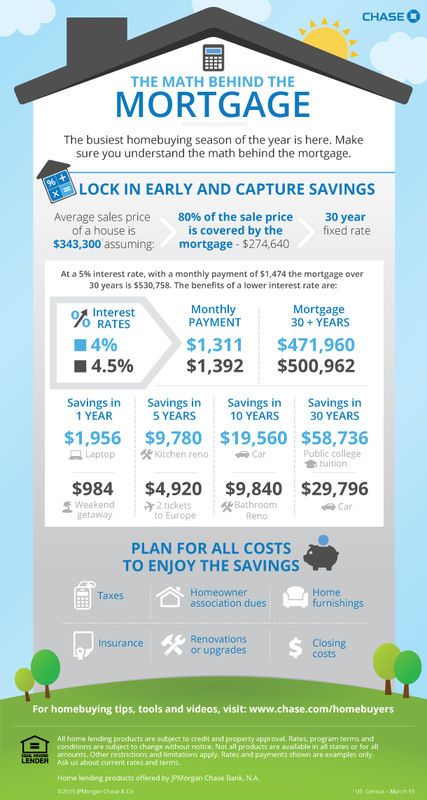 On an average home nationwide, the savings from having a 4% mortgage rate versus a 5% mortgage rate is nearly $60k over 30 years. If the interest rate is higher by 1% by the time my friends buy a home, the added cost of ownership is further magnified by the higher cost of homes in the San Francisco Bay Area. These days the homes my friends are looking for within a reasonable commute easily cost $1 million. A home in a good school district can cost $2 million. With a 20% down payment, the difference in monthly payment between a 5% interest rate and a 4% interest rate is $475/month. It adds to up $171k over 30 years. No wonder my friends are looking to buy sooner rather than later. Even though my friends aren’t first-time buyers, they can still benefit from resources offered by Chase at chase.com/homebuyers. The mortgage programs and qualifications changed since they bought their homes last time. With more competition among buyers and many cash offers, they will have to be extra prepared in getting their loan prequalified and approved. If they get a mortgage from Chase and have it automatically deducted from a Chase checking account, they can get 1% cash back up to $500 a year. The elephant in the room is of course whether real estate prices in the San Francisco Bay Area will keep going up, come crashing down, or go stagnate, and if it goes up how fast it will go up, if it goes down how deep it will go down, or if it will go stagnate how long it will stay flat. Although I’m not in the market for an upgrade, I wish my friends good luck in getting homes they want.